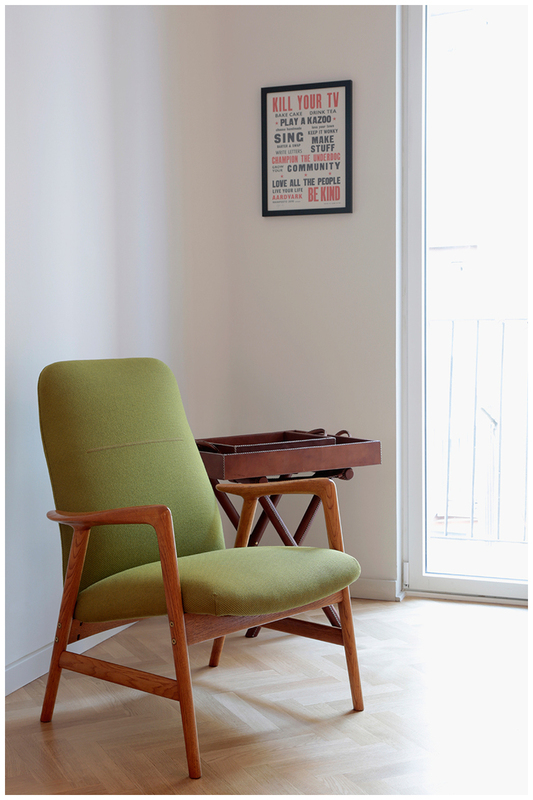 This apartment is located in the up and coming neighbourhood of Poble Sec, Barcelona. 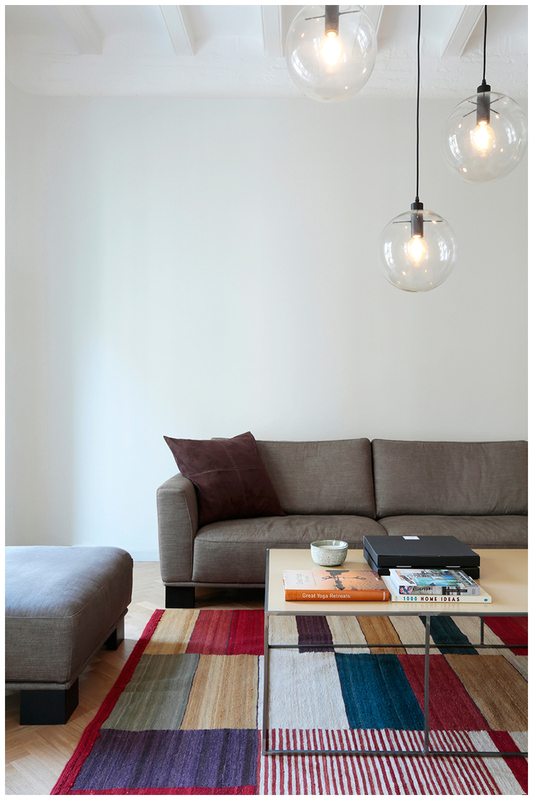 The brief was to turn this dark and compartmentalized apartment into a modern pied à terre for a Swiss client. Working a power job in the cooperate world, we wanted to create a home that transpires a laid-back atmosphere. An open, fluid sequence of spaces and functions, and an unobstructed view from one end of the apartment to the other was our recipe to create this retreat from everyday life. We encountered the typical long tube with light at least coming from either ends. In order to create a generous living space we created an imaginary diagonal that divides the floorplan into a functional, and an open triangle. With a set of structural beams we freed the floor plan and secured the wide spanning beams of the ceiling. 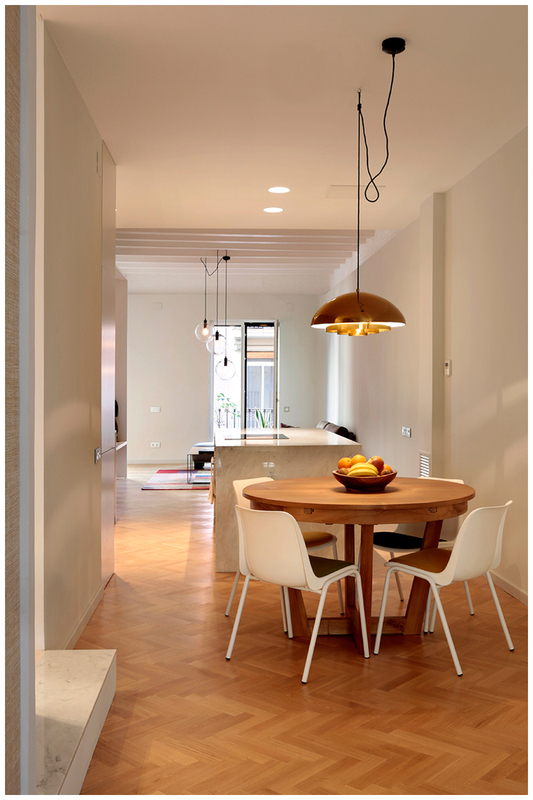 We decided to use oak parquet, laid out in hungarian point, to give the apartment an effortless elegance, and a warm base to built up on. The walls are covered with plasterboard, with rounded corners to enhance the softness and fluidity of the space. The plasterboard does not reach the full height, leaving exposed the original brickwork. Whilst the plasterboard is painted in a light grey, the bricks and ceiling are painted in white. The original vaulted ceiling is left exposed for most of the open space. Only in the center, above the kitchen we lowered the ceiling to house the air-con unit and create a division between front part, kitchen area, and back part. Slightly raised by one step, the main idea for the bedroom is to be able to open it up through three door panels, to give the owner the possibility to be more enclosed or connected to the open space. These three rotating panels are covered in textured wallpaper, imitating linen. Having one side in beige, and the other dark grey, one can change the atmosphere of the room. There is also a curtain that hides a small wardrobe section and the large window of the adjacent bathroom. The ceiling has also been lowered to create a more intimate atmosphere. The bathroom is a multifunctional space, housing also the main part of the wardrobe. Apart from a walk in shower hidden behind the sink, there is also a bathtub, which has a large window onto the bedroom. This allowed us to bring in light and views into this internal space. Since the bathroom is quite exposed we hid the toilet in a separate space. A large window helps to let the space appear bigger, also creating interesting viewpoints. being the heart of every home, we placed the kitchen in the center of the open space. Two blocks, one against the wall and the other placed in the middle, house all functions. The fridge is integrated into the bathroom block, and being painted in the same color as the walls, almost disappears. A row of open shelves is situated in the corner for everyday storage. Whereas the fronts are in stainless steel, the work surfaces and sides are covered in white marble, adding to the kitchen an industrial chic. The extractor is integrated into the lower ceiling to not obstruct the views. 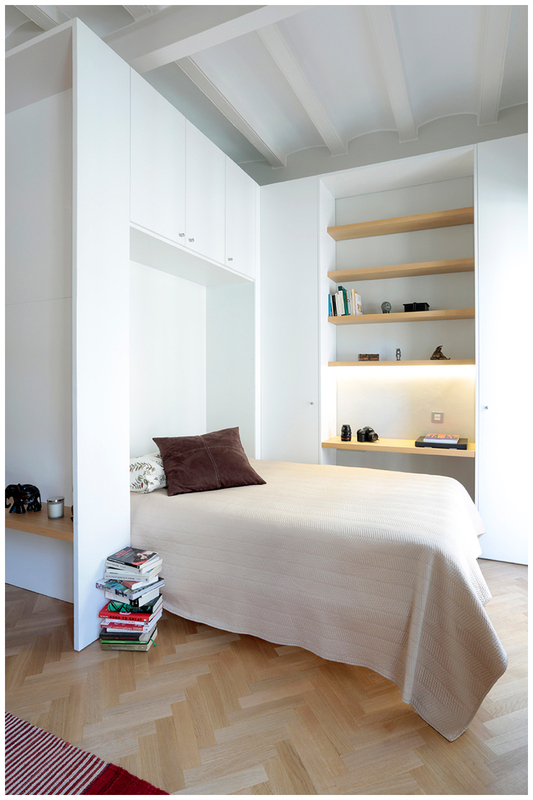 Having limited space, we convinced the owner that a second bedroom would really undermine the openness of the space, and ultimately just be an excuse to have a big storage with little use. Instead, we opted for a guest bed that can be taken down when needed, or be hidden behind one of the cabinet doors in the studying area. This helped us to preserve a generous living area, with an abundance of light coming in through both windows, looking onto the street. Since the owner sometimes works from home, we designed a small writing desk with a book shelve on top, and extra storage space on each side.